Coaching legend, multiple trophy winner and humble soul: Jupp Heynckes is rightly celebrated as a leading contributor to the beautiful game. Yet just as he is hailed by all connected with Bayern Munich, the tactician is no less a legend at Borussia Mönchengladbach. Sprinting forward, that wavy 1960s hair flowing in the breeze, a young, athletic Heynckes looks up to spot a teammate. With none in his line of sight, the striker races into the area and sends a thumping finish past a sprawling goalkeeper to give Gladbach a crucial advantage. Scenes just like this were played out across two decades for a Foals side that, for a time, dominated the Bundesliga. 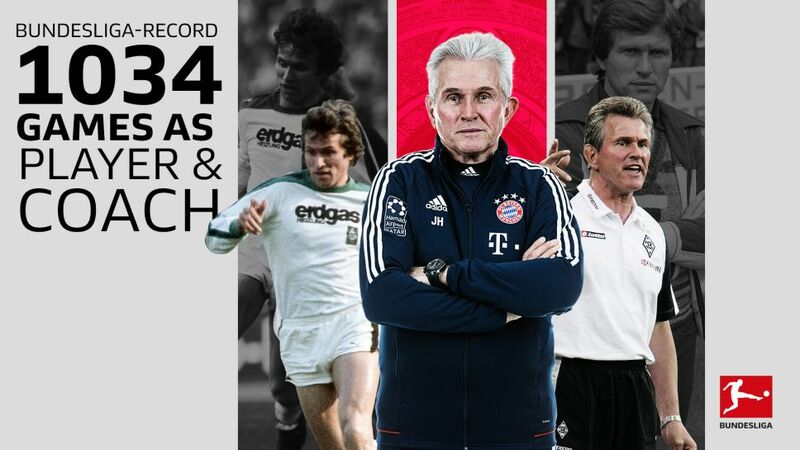 Watch: Heynckes's top five moments! During two hugely successful spells with Die Borussen, Heynckes scored 218 goals, won four Bundesliga titles, a UEFA Cup and the DFB Cup. While at the club, he was twice the Bundesliga’s top goalscorer and became a world and European champion with Germany. All phenomenal achievements that very few players have ever matched. Heynckes’s coach at Gladbach over many years was the famed Hennes Weisweiler, a man known as a football visionary and whose managerial career spanned 35 years. Incredibly, after his return to lead Bayern one more time last October, Heynckes has equalled that astounding time frame in the dugout. The Bavarian giants’ latest title win under their current tactician means he, too, now has four as a coach, just like his mentor Weisweiler. By the time the current campaign ends, Heynckes will be 73, the oldest person to guide a team to Bundesliga glory. On Matchday 30 - appropriately enough in a 5-1 rout of Gladbach - he was involved in game number 1,034, meaning he has surpassed one more legend, ‘King’ Otto Rehhagel, who racked up 1,033 matches as a player and coach with several German sides. It’s a phenomenal figure, which, if placed in sequence, would mean that Heynckes was involved in a Bundesliga match every day for three years. Bayern’s opponents on Saturday are facing into their 1,700th game in the Bundesliga. Not enough records? Then we offer you this: the time span between Heycnkes’s first title as a coach [a championship win with Bayern in 1989] and his latest, reaches across 29 years, something nobody else can boast. And there could be much more to follow. An unprecedented second treble is on the cards, with Bayern facing into UEFA Champions League and DFB Cup semi-finals having already captured a 28th German championship last weekend. The challenge now for this extraordinary footballing leader is to keep his team hungry in the remaining five top-flight fixtures, something that wasn’t a problem during the treble win in 2013. Having wrapped up the Bundesliga by Matchday 28 five years ago, Heynckes oversaw five wins and a draw in the team’s remaining six matches. “You have to look back to when myself and [assistant] Peter Herrmann came in last October, we did not think we were going to be champions with five games to spare and to be semi-finalists [in two other competitions],” Heynckes said last weekend. “I feel like I’ve reached [the players]. We work together as hard as we can and without selfishness. Our championship win is extraordinary and worthy of praise." Click here to recap Bayern's 5-1 drubbing of Gladbach!